Baby Buddies by Whistler Studios is an adorable collection filled with a soft pastel color palette and sweet gentle prints. 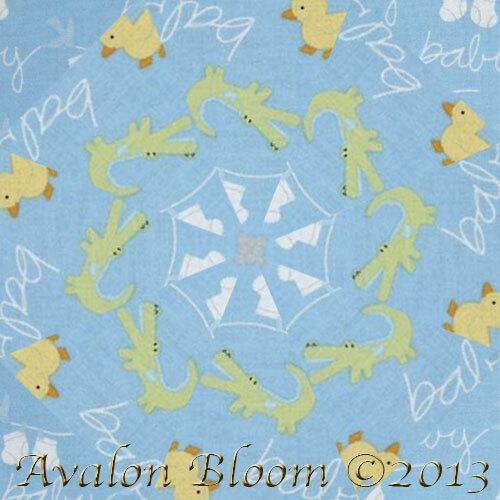 From teddy bears to little duckies to baby socks drying on the line, this fabric is just too cute for words. Make all sorts of projects such as diaper bags, bibs and nursery decorations. Baby Buddies is the perfect collection to put together little gifts for your most cherished little friend. 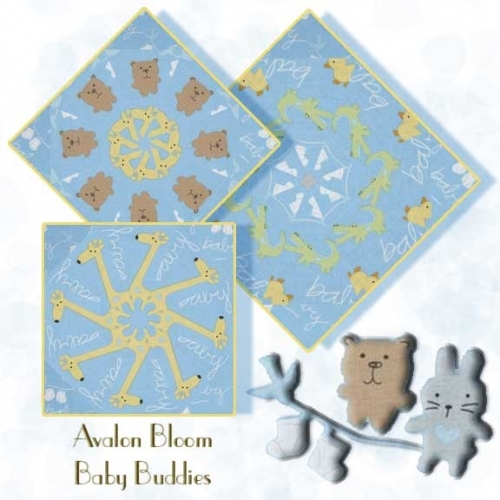 Baby Buddies by Whistler Studios for Whindham Fabrics Pattern 35120-2 This is a precut kit to sew a set of 12 kaleidoscope quilt blocks. Finished dimension for all blocks sewn together is 24 X 32 inches Each block measures 8 1/2 inches square when sewn. Our Fast and Easy Blooming Blocks© are cut from 100 percent cotton fabric. Each block in the set will be uniquely different due to layering the fabric in exact repeats to create a kaleidoscope effect by precisely rotary cutting them.They are specially cut so that the centers will lie flatter and so there is no bias on the edges of the block so they lie flat in your quilt. You can put these blocks together in a quilt in different ways. Illustrated instructions included to complete the blocks that even a be ginner can understand as well as bonus instructions for dimensions to include these blocks in a King, Queen, Double, Twin or Baby Crib, wall hanging quilt as well as a Table Runner or Placemats.